PARIS (CNN/NEWS10) -- It's known as "Our Lady of Paris", an iconic piece of gothic architecture with more than 13 million visitors to the Catholic site every year. On Monday, she was engulfed in flames but thanks to hours of intense firefighting, the Notre Dame Cathedral still stands. The cathedral was undergoing renovations at the time of the fire. Nine hours after the fire started, the fire that engulfed the cathedral was finally out. While the spire and the oak wood roof were destroyed, the two bell towers and the front facade were saved. Along with some of the most precious religious artifacts, including the Holy Crown that many believe is from the Crown of Thorns Jesus Christ wore at his crucifixion. 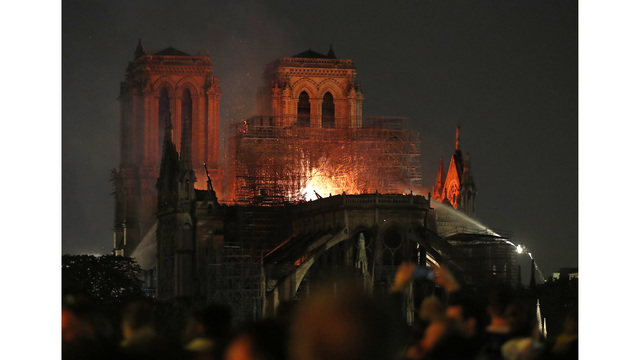 French President Emmanuel Macron vowed that they would rebuild Notre Dame, and will be relaunching an international fundraiser. So far, there have been millions raised to help rebuild the historic cathedral.